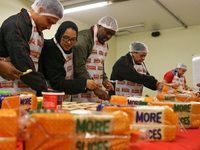 The staff of Sasko bakeries across the country spent their 67 minutes for Mandela Day making sandwiches that were donated to schools in their respective areas. The staff also donated books to school libraries. 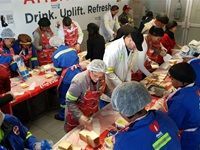 To play its part in giving back to communities this past Mandela Day on 18 July 2018, Coca-Cola Peninsula Beverages and its partners used its 67 minutes to distribute food parcels to various places in the Western Cape. 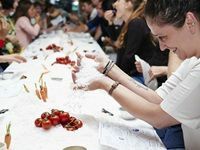 Cape Town-based food design agency Studio H will be hosting a series of pop-up waterless dinners prepared with salt tolerant crops. 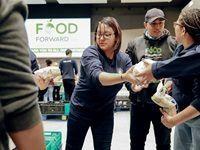 The first event took place in Cape Town on Tuesday 23 January. 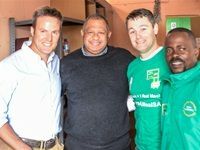 Unilever Food Solutions supported World Food Day on 16 October 2017 by donating a chest freezer and by inviting chefs to #ShareAMeal with children at the Pauline Podbrey Foundation in Khayelitsha, Cape Town. The Pauline Podbrey Foundation offers after-school educational support and sports activities to children from the local community and provides them with a daily meal. 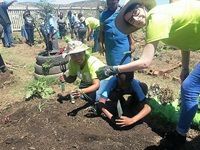 At least 200 employees from Woolworths' Employee Community Involvement Programme worked with learners at ten schools' permaculture food gardens on World Food Day, 16 October 2017. Groups of 20 volunteers worked side by side with learners and educators to dig new beds, mulch, compost, plant and water. 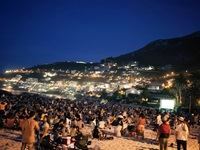 The Wavescape Festival in Cape Town, an ocean-minded event, included film screenings, art exhibitions, ocean talks, filmmaking workshops and a charity auction. A record R328,000 was raised and will be making its way to four important ocean causes.